Clarissa Harwood's Bear No Malice is an entrancing historical novel set at the same time as her debut, Impossible Saints, but with the antagonist from that book, the arrogant Tom Cross, transformed into a hero -- and it works! Kidnapped away from London and badly beaten, Tom recuperates at the quiet Surrey cottage of his rescuers, siblings Miranda and Simon Thorne. They have taken up residence in this out-of-the-way locale for reasons having to do with secrets in Miranda's past. Tom, who has just broken off an affair with a married female parishioner, decides to keep his own identity secret from them, including his status as a canon of St. John's Cathedral. The story of Miranda and Tom's growing friendship is moving and unexpected, and the dilemmas they face aptly reflect their personalities and the social mores of the early 20th century. I'm grateful to Clarissa for answering my questions about her writing. Bear No Malice may be a companion novel to Impossible Saints, but for new readers, it does stand alone equally well. How challenging was this to accomplish? When I first started writing Bear No Malice, I didn’t realize I was writing a companion novel: I thought I was just having fun with a writing exercise to see if I could turn Tom, the “villain” of Impossible Saints, into a hero. Or to put it another way, I was trying to view the conflicts between rival clergymen Paul and Tom from Tom’s point of view for a change. I didn’t realize the writing exercise would turn into a whole new novel! Although I always saw the two novels as connected, I worked on them at different times and treated them like separate novels, not thinking about the potential challenges that could arise should they both be published. The real challenge came after Impossible Saints was published last year and I was working on revisions to Bear No Malice. Because two scenes are the same in both books (but told from different characters’ points of view), and they cover the same time period, I had to change the time frame of Bear No Malice. The biggest difficulty in this respect was having to change the seasons: the original opening chapters of Bear No Malice were set in rural England in the summer, and I had to change them to winter scenes. I nearly despaired when I realized that a gardening scene had to take place in late November, but after an intensive bout of research, I was saved by the hardy parsnip! As someone who hates gardening, I now know far more than I ever wanted to about vegetables that can be harvested in England in November! This novel shows readers a different side to Tom Cross, the nemesis of Paul from Impossible Saints. I think he makes for a terrific hero! What new aspects of his character did you learn about during the writing? Thank you! It took me ages to warm up to Tom because I’d thought of him as a villain for so long while inhabiting Paul’s point of view in Impossible Saints. I had to interview Tom many times and learn how to listen to him (to this day he is the only character in any of my novels who ended an interview abruptly by cursing me and walking out!). Many times I rued the day I cavalierly imagined an annoying colleague for Paul while writing the first draft of Impossible Saints without thinking that someday I might need to spend a great deal of time with that annoying colleague. Now I love both Paul and Tom equally: it’s as if they’re two squabbling sons of mine! My first impression of Tom was of a womanizing, arrogant, domineering man, but as I got to know him better with each draft of the novel, I saw how complex he really was underneath his lies and masks, and his good qualities began to shine through: he’s a genuinely warm person, the best kind of extrovert who wants to help others. And yes, he is deeply flawed, but he’s also willing to learn and change. What new research did you have to conduct for this novel? What was the most fascinating thing about the research process? New research for Bear No Malice with respect to Miranda, my female protagonist and artist, had me delving into the art world of Edwardian England. And without giving too many of Tom’s secrets away, I needed to research social reforms and reformers of the era. I learned about child labor, the slum areas of London, prison reform, and illegal boxing clubs. The most fascinating discovery I made was a real-life historical person, Osborne Jay, who was the perfect mentor for Tom and an important influence on Tom’s work at the end of the novel. This is not the first time I’ve imagined a character who would fit perfectly into my novel’s world, only to find in the course of my research that such a person really existed! 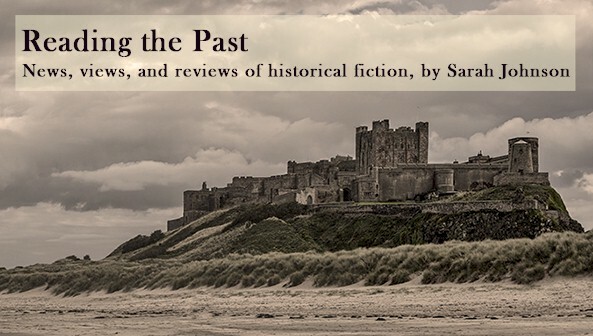 What I love most about writing historical fiction is the way research and imagination trigger and feed off each other in an endless cycle. As a historical novel heroine, Miranda is an original character: she’s reclusive, highly observant, and needs her solitude, and that’s on top of her difficult-to-overcome past. How did you develop her personality? Some characters seem always to have existed in my mind and are just waiting for a story. Miranda is one of them. I always wanted to write about a Lady of Shalott figure who is isolated from the world because of a secret or curse in her past. Miranda was also an easy character to develop because I can relate to her personality very well. I can understand her better than Lilia (the suffragette protagonist of Impossible Saints) because she’s more conventional on the surface, whereas Lilia is always storming around doing things that scare me. I love Miranda’s quiet strength and stubbornness, and she’s just as much a feminist as Lilia in her own way. In the first stages of writing Bear No Malice, my biggest challenge with Miranda was trying to figure out what she saw in Tom, despite his obvious physical attractiveness. But even that was not so much a problem with Miranda as it was with my reluctance to really get to know and understand Tom. Since both novels involve cathedral canons, I can’t resist asking: do you have a favorite English cathedral? York Minster! No question. York is an amazing city, and the cathedral there has a beauty and ambience like no other. I could spend weeks wandering around inside it. St. Paul’s in London gets an honorable mention: I’ve visited it several times and especially love the whispering gallery. My first day visiting a new city always starts at the cathedral (if there is one), so if I had the time and money, and if my traveling companions didn’t object, my trips would be all cathedrals all the time! Bear No Malice was published by Pegasus Books this month. For more information, visit the author's website at www.clarissaharwood.com. Thanks for stopping by and commenting - glad you found it interesting to read! That's a great question. I loved York Minster also, but I'm also fond of Salisbury Cathedral (the cathedral close is large and especially beautiful) as well as the Salzburg Dom in Austria. We happened to be visiting the Dom during one of their evening choral concerts, and it's an experience I won't forget, even though I couldn't understand the words! I've never been to Salisbury Cathedral or the Salzburg Dom. Two more to add to my to-see list. Thank you! 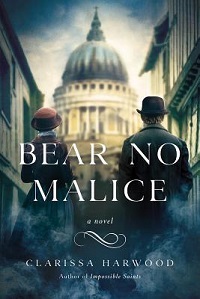 I am really interested in reading "Bear no Malice"